Bo Chung, Miriam Magaña, Erika Sarmiento, and Gladis Chávez all obtained their master's degrees this year from UC Berkeley's School of Public Health. The day I walked across the stage at the Greek Theatre with other 2018 master’s graduates from UC Berkeley’s School of Public Health was also Mother’s Day. For me and other students from the Borders and Bodies Collective, the day was filled with mixed emotions. Although I was filled with joy as I walked across that stage to smiles and cheers, a knot formed in my throat at the thought about the sacrifices my parents made for me to get there. They left a life in Hong Kong and raised two boys in a foreign land to ultimately give us this opportunity. As each one of my friends from the Borders and Bodies Collective crossed that graduation stage, I knew that they, too, were standing on the backs of giants. Giants who, like my own mother and father, braved countless dangers, walls, hate, ignorance, pain, and even death. Who, with full hearts and broken bodies, would witness their children crossing the graduation stage carrying forward their hopes and dreams for a brighter future. 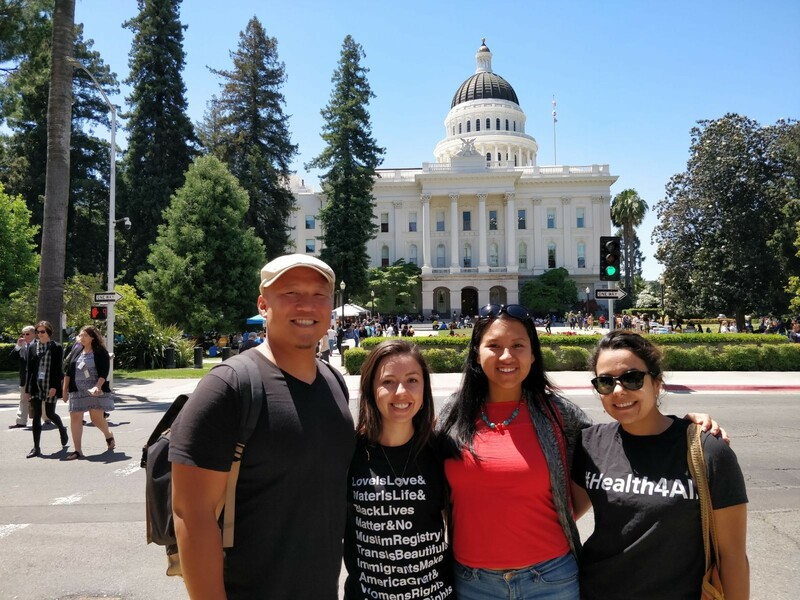 That’s why the day after graduation, we raised our voices at the steps of the California capitol in support of expanding health coverage for low-income undocumented Californians. Currently, two champions on health care, Senator Ricardo Lara (D-Bell Gardens) and Assemblymember Joaquin Arambula (D-Fresno), have authored legislation — SB 974 and AB 2965, respectively — that would extend Medi-Cal eligibility for low-income undocumented adults ages 65 and older and individuals under the age of 26. Although the Affordable Care Act has helped millions of Californians gain health insurance, undocumented immigrants remain explicitly and unjustly excluded from health coverage, even though they contribute $3 billion to our state’s economy, and are an essential part of industries such as agriculture and domestic service. Thanks to hard-fought efforts by undocumented leaders, California has already passed #Health4AllKids, which has made it possible for undocumented low-income children under the age of 19 to access comprehensive Medi-Cal. Access to key screenings and checkups are critical to preventing costly health emergencies and promoting healthy habits. But children’s well-being does not exist in a vacuum, and access to basic health coverage needs to be extended to their caretakers as well. We need to fight boldly to extend health care to the parents and elders on whose shoulders we stand. Currently, the cruel reality is that many individuals who are vital to the social, cultural, and economic fabric of our state are locked out of health coverage because they lack documentation. In a state that’s home to an estimated 2.5 million undocumented immigrants, California has an opportunity to move our health care system in the right direction. For undocumented immigrants, living in fear and uncertainty is still a daily reality, increasing with the growing threat of targeted and discriminatory actions by the Trump administration. From ICE agents raiding our communities to for-profit detention centers opening for asylum-seeking families, the mental and physical health and well-being of our communities are under state-sanctioned attack. With Health4All, our state can safeguard the health of all Californians, including our undocumented loved ones, neighbors, grandparents, and community members. On top of being a health benefit to a large portion of the state’s population that has been excluded from care, this will help reduce the fear among immigrants seeking health services and increase utilization for preventable conditions. Now it is up to every Californian to call their legislative leaders and Governor Jerry Brown to urge them to extend access to health care coverage through SB 974 and AB 2965. 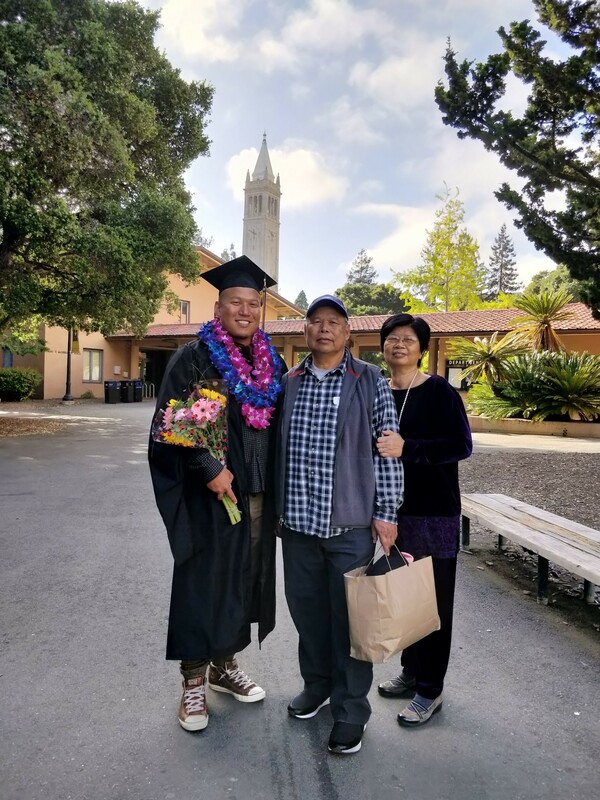 Bo Chung and his parents at graduation. Dreamers are not only those who walk across a graduation state, daring to achieve their dreams through education, but also parents who have braved countless perils to get us here. It is time we recognize the contributions of all of those who call California home. If California’s legislative leaders support Health4All for young adults and elders, we can ensure that Californian takes a historic and powerful step toward ensuring access to comprehensive, preventative care for all, no matter where they are born. Miriam Magaña contributed to this piece. Bo Chung was born in Hong Kong and immigrated to the United States with his family at the age of six. He is fascinated with the urban environment and wants to promote healthy equitable cities for all. He has recently graduated from the dual masters’ program in city planning and public health from UC Berkeley. Miriam Magaña was born in Jalisco, Mexico, but has called the North Bay her home since she was five years old. She is passionate about ensuring that everyone, regardless of race and immigration status, has an equal opportunity for a healthy life. She has recently graduated from UC Berkeley with a master’s degree in public health.